Two facts that prove you should start freelancing now! Should you bill your freelance clients for meeting time and other misc. work? Q&A: Do I need a contract for every design project, even small ones? Do long-term goals scare or motivate you as a freelancer? The death of the call to action in design? Where will I see you in 6 months? How safe is your “job security”? 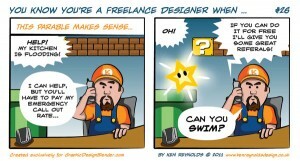 Is it time to start freelancing? Entrepreneur vs Freelancer – Is there a difference?